I personally seize this opportunity to thank you Hon. Commissioner for Information and Strategy, Mr. Charles Udoh for believing and investing in the youths of Akwa Ibom State for a better tomorrow. 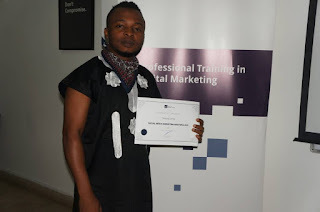 Sir am personally thankful for this privilege to be a professional in the area of Digital marketing. This has not just added to my profile but has boosted the possibility of enhancing the media unit of the government of my state Akwa Ibom from now on. I have come to the knowledge of how media should be handled professionally. According to the CEO of Wild Fusion, Mr. Abasiama, "the era of oil is over and the world will only focus on people with mental strategy and digital concept". This is absolutely true. The world now seek for innovators which u have single handedly transformed 10 of them via this training. Sir, this is definitely a path that will lead to a digital Akwa Ibom. My Commissioner Sir, I know many of your peers in the government sector who even have more than you do but will never do this for young minds like us. Rather they will prefer spending on illicit things which by tomorrow will never be remembered by any. HC, God will bless you for this Kind gesture as we (the Professional Digital Marketers) will always make our State proud.